Every fall and winter my friends and I find ourselves in a lonely world of coughs, sneezes, and sniffles, especially in the daycare world. Whenever we try to make plans, someone’s kid is sick and we have to choose between being the overly protective parent who cancels to avoid germs or the “cool” family who meets up with Typhoid Mary and then ends up with a perma-cold (or worse). 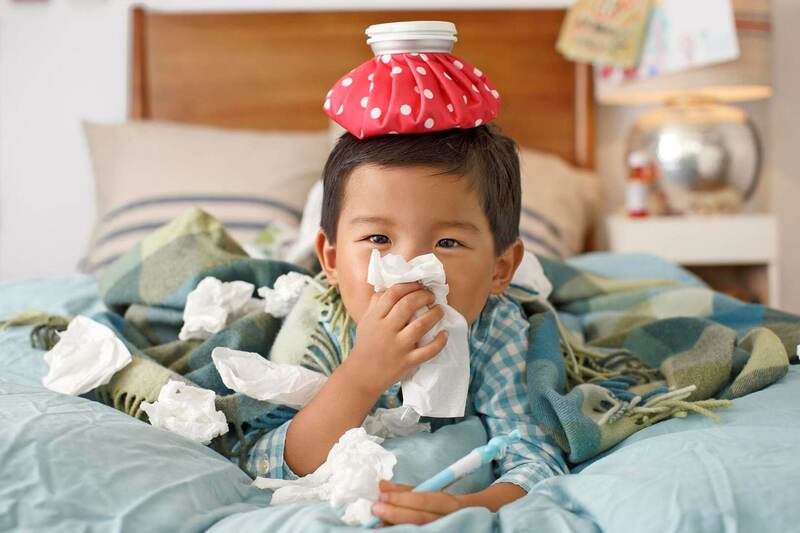 This cold-and-flu season, I am determined to help my family stay healthy any way possible, so I reached out to top preventive medicine doctors for tips and strategies. This five-step plan can help all of us take fewer sick days. While it’s true that the flu shot isn’t 100 percent effective, recent studies show that getting one can slash a person’s risk of contracting the potentially debilitating illness by about 50 to 60 percent. Plus, if you do catch this year’s flu, having had a flu shot can make your symptoms milder. Just a quick update for parents of needle-phobes: The nasal spray, a welcome alternative for children ages 2 and older, is once again given the green light by the Centers for Disease Control and Prevention (CDC) for the 2018-2019 season. In summer 2016, the CDC advised against using FluMist for the following flu season, claiming that data showed it wasn’t effective at preventing the virus. 2. Wash everyone’s hands—a lot. A study conducted on schoolkids in Grosse Pointe Park, Michigan, found that scheduling at least four hand-washing breaks a day reduced the average student’s number of sick days. It worked especially well for stomach bugs, cutting the risk of absences due to illnesses like diarrhea by more than half. Lathering up with soap and water (any temperature is fine—research suggests warm doesn’t work any better than cold), and then scrubbing for at least 20 seconds, is the best way to get rid of germs, according to the CDC. Second-best: applying a hand sanitizer that contains alcohol. 3. Stick to bedtimes (you too!). Sleep is a cornerstone of a healthy immune system, says, well, everyone I interviewed for this story. And the best way for you and your kids to get the sleep you need is to set a bedtime and stick to it consistently, says Parents advisor Judith Owens, M.D., director of the Center for Pediatric Sleep Disorders at Boston Children’s Hospital. “There’s a fair amount of evidence to suggest that the key is not just getting the right amount of sleep but also keeping your schedule consistent,” she says. It’s fine to stay up and sleep in by a half hour on the weekends, but if bedtime or wake time shift more than about an hour, that can interfere with circadian rhythms, says Dr. Owens. Just how important is sleep? In one seminal study published in 2009, researchers administered nasal drops that contained a cold virus to more than 150 adults. Those who had averaged less than seven hours of sleep nightly for the prior two weeks were almost three times more likely to get sick as those who had slept eight hours or more. Children need even more rest— anywhere from eight to 14 hours a night, depending on a kid’s age. Obesity goes hand in hand with chronic inflammation, in which certain immune chemicals are constantly increased in the body instead of only when needed to fight off infection. This state of constant low-grade alert can make the immune system less effective overall, says Melina Jampolis, M.D., a physician nutrition specialist and author of The Doctor on Demand Diet. But eating more fiber—found in fresh fruit, veggies, and grains— can help reduce inflammation in the body, and that in turn allows your immune system to function better, she says. Cutting back on sugar may help too: “Sugar causes insulin levels to spike, and high insulin increases inflammation,” says John Stracks, M.D., assistant clinical professor of family and community medicine at the Feinberg School of Medicine at Northwestern University. Sticking to a healthy diet might even make your flu shot work better: Research in the International Journal of Obesity suggests that obese people have a decreased immune response to the flu vaccine compared with those who aren’t obese. Take the right supplements. All you need to give kids is vitamin D (found in many children’s multivitamins), vitamin C (the best sources are certain fruits and vegetables, including oranges, grapefruit, bell peppers, and kale), and a probiotic, says Dr. Jampolis. Evidence is growing for the importance of vitamin D in fighting colds and flu; since it’s difficult to get enough from food and sunlight can cause skin cancer, the American Academy of Pediatrics recommends all kids take at least 400 IU of vitamin D a day, beginning in infancy. The official recommended dose for adults is 600 to 800 IU per day, but many experts recommend taking even more. Probiotics also show a lot of promise. The beneficial bacteria keep the peace throughout the gastrointestinal tract, decreasing inflammation and, in turn, helping your immune system respond properly to viruses like the common cold. “I highly recommend probiotics to favorably balance the intestinal microflora. After all, more of the immune system is located in your gut than anywhere else in your body,” says Donald B. Levy, M.D., assistant professor of medicine at Harvard Medical School and director of the Osher Clinical Center for Integrative Medicine at Brigham and Women’s Hospital, in Boston. A review of research published in 2015 found that adults and children who consumed probiotics experienced about 47 percent fewer acute upperrespiratory-tract infections than those who took placebos. I’ll take those odds.